We’d love your help. Let us know what’s wrong with this preview of The Stars May Rise and Fall by Estella Mirai. Teru came to Tokyo with dreams of making it big in the glam-metal visual kei scene, but three years later, all he has to show for it is a head of hot pink hair and some skill with an eyeliner pencil. He may look the part, but he doesn’t sound it, and constant bickering among his bandmates has him worried about his future. When he finds a mysterious business card in his bag Teru came to Tokyo with dreams of making it big in the glam-metal visual kei scene, but three years later, all he has to show for it is a head of hot pink hair and some skill with an eyeliner pencil. He may look the part, but he doesn’t sound it, and constant bickering among his bandmates has him worried about his future. When he finds a mysterious business card in his bag, he’s willing to take any help he can get. To ask other readers questions about The Stars May Rise and Fall, please sign up. They fit together, here as well as anywhere. Like pieces of a puzzle. Like a lock and a key. A beautiful WOWmazing debut novel from Estella Mirai! Good story with memorable characters that will stay linger in me long after I finished the book. This book is like a gem in the sea of new release books at nearly end of this year and I’m so glad that I decided to give this book a try at first sight when I read the blurb back then. The story brought back the memories from my teenage life when the visual kei band were on the top of Japan music industry at that time. I grew up with X-Japan, L'Arc en Ciel, Malice Mizer, Luna Sea, Dir en Grey, GLAY and many more visual kei band at that time. I even become Gackt and Hyde shipper back then and cried hysterically when saw they stared a movie together (Moon Child 2003). So, yes! Reading this book that set in year 2000 and found those names being mentioned succeed throw me back to the era when those visual kei rock band group top the world. Following the story of indie visual kei band, La Rose Verboten and their struggles to survive in the strict competitive with the other VK band to steal the spotlight and being seen are interesting. And I love how the author combined the struggle of the new band in gaining their success and the love story between a shy drummer turned singer, Teru and a mysterious talented composer with tragic past, Rei which pictured in a very poignant and heartwarming story. Last but not least, I want to say thank you to the author for bringing back those nostalgic memories through her writing. I even digging back my X-Japan and L'arc en Ciel music collection and played it as a companions music during the reading. So, again...Thank you! I don't think I was mentally prepared for this book. I don't know much about Phantom of the Opera other than the main gist. Whether this story is a true retelling or not, I could not tell you. The story was well written, it definitely provoked some strong feelings to the point that I had a hard time moving on from the story and picking up another. It is a heavy read with heavy themes. I was in a constant state of unease throughout most of the story. I just didn't know where things were going and I don't think I was mentally prepared for this book. I don't know much about Phantom of the Opera other than the main gist. Whether this story is a true retelling or not, I could not tell you. The story was well written, it definitely provoked some strong feelings to the point that I had a hard time moving on from the story and picking up another. It is a heavy read with heavy themes. I was in a constant state of unease throughout most of the story. I just didn't know where things were going and how they would make it to an eventual happy ending. The setting is spectacular, set in Japan's indie music scene in 2000. The author does a great job of painting a vivid picture of this time and place. Teru is a bit self-conscious, aware of his individual abilities and limitations while struggling with his sexual identity. Rei is struggling in a different way. Horribly disfigured right before his career really took off and he is also dealing with a heavy dose of survivor guilt. Two people meet and I guess they fall in love. They don't really know each other before Teru is sure he loves Rei. He is definitely grateful to Rei for the doors he opens, but I wasn't convinced that those feelings were strong enough or had time enough to translate into love. Rei has promised himself to a ghost and has vowed to never love again. If he cares about Teru as a person rather than just a vehicle to help his dead lover live on, it wasn't readily apparent. A lot of Rei and Teru's time together, adjusting to each other and getting to know one another happens off page. We get time jumps of days, weeks, months, so a vast part of Teru and Rei's relationship actually happens off page. For all that this was a story about Teru and Rei, I never really felt that I knew Rei. He was deliberately cruel at points, yet bent to Teru's needs and wants willingly at times. He could be forgiving, yet cold at other times. I think the story would have benefited from his point of view and may have helped go a long way with helping me to understand Rei's feelings for both Saki and Teru. My main misgiving with this book, which is usually a deal breaker for me in any book - is when one character essentially has to compete with a ghost. It is a storyline that I do not like. I never felt like Teru had a chance and the ending did not help reconcile my feelings with it. Teru gave so much of himself and I just felt like he deserved more. I wanted him to have MORE. I wanted to feel him being loved fully, without compromise, without doubt, just as he loved. That being said, this could have been a 5 star read for me but the ending just wasn't enough to reconcile my earlier misgivings. All that work to get to where they were in the second to last chapter and we didn't really get to experience how they moved forward. I like my characters to get a happy ever after (which these two get), but I also like to actually experience it with them. Oh, and this is fade to black, so no steamy scenes. Which was...disappointing. I talk a lot in this review of what Teru deserved. Well, Rei deserved for us to see how his disfigurement did not affect the pleasure he and Teru were able to give and take with each other. Especially because of other things that happened in the book with Teru and Rei's first foray into intimacy. As promised in the blurb, this is a reimagining of Phantom of the Opera set in the indies visual kei music scene in early 2000s Japan (visual kei is something like glam rock, but the costuming ran towards the dramatic and gothic during this era). The Phantom elements launch Mirai’s story into darker, angst riddled territory. Teru is facing an identity crisis. Not only is he trying to reshape himself from a drummer into a front man, he’s confronting his sexuality. A Joyfully Jay review. The relationship between Teru and Rei is one of the two themes that hold the story together, the other being drama that unfolds around Teru’s band, La Rose Verboten. For me, the band activity felt more like background busy work against which the real drama of Teru and Rei unfolds. Having never read or watched any version of the original Phantom of the Opera I came into this book with no preconceived expectations, that being said I enjoyed every minute of it. Teru and Rei were such well-written characters and it was very enjoyable watching them evolve as people and also watching their relationship evolve as they both work through their issues. Their journey to their HEA was well worth the read. I absolutely LOVED this fantastic, poignant, bittersweet, engaging, emotionally charged, grab-you-by-the-feels, beautiful, smoldering, gripping, raw, intense, and fascinating fresh and modern day twist on the classic Phantom of the Opera. This is one of those reviews that is tough for me to write. It was a beautiful story, but I didn't feel like it reached it's full potential. A big part of that may have been my expectations, which get me into trouble frequently. I expected a grand romance, and what I got was more subtle. Most of the story takes place over the better part of a year, but we get a lot of jumping forward in time while things stay the status quo. I wanted more relationship development between Teru and Rei, and I want This is one of those reviews that is tough for me to write. It was a beautiful story, but I didn't feel like it reached it's full potential. A big part of that may have been my expectations, which get me into trouble frequently. I expected a grand romance, and what I got was more subtle. Most of the story takes place over the better part of a year, but we get a lot of jumping forward in time while things stay the status quo. I wanted more relationship development between Teru and Rei, and I wanted to feel what Teru was feeling. It may have been that we were told instead of shown, or it may have just been me. I think it would have also benefited from Rei's point of view. The climax caught me by surprise in the feels department, though, which tells me that I was more invested than I thought. While it didn't knock my socks off, the story kept me engaged from start to finish and I think that I will remember it. I really enjoyed the Tokyo setting and especially the way the music was written. I never would have guessed that this was a debut novel. Highly recommended, beautifully imagined and written. I love Phantom of the Opera, so I was intrigued by the premise. Such a beautiful and bittersweet interpretation of the original story and being set in Japan added a new level of intrigue for me. Rock star romances are my jam, so there was no way I was going to let this book pass me by. MC Teru is one of those quiet, introspective types. Having the story of his band told through his eyes gave this contemporary take on The Phantom of the Opera a refreshing overhaul. The reader and Teru both learn a lot about Teru through each chapter. The setting, Tokyo at the turn of the millennium, is unique and was the perfect place for such a unique story. I enjoyed reading about the city--even the publ Rock star romances are my jam, so there was no way I was going to let this book pass me by. The setting, Tokyo at the turn of the millennium, is unique and was the perfect place for such a unique story. I enjoyed reading about the city--even the public transport--and life there at that time. Rei is hauntingly mysterious and talented. It took a few chapters after his introduction for me to warm up to him, but I get that that is only his personality. He's a prickly man, and rightfully so. I enjoyed getting to know Teru's bandmates and friends, and appreciated how they each complimented the story in some way. There were no useless, out-of-place side characters here. This is a well-crafted story that's not only about finding romance where (and with whom) least expected, but also about discovery. I am extremely conflicted over The Stars May Rise and Fall and I've never really felt this way about a book before so if this review rambles a bit that's why. I finished this several days ago but really needed time to process things and figure out why I struggled. I’ll start with the good: I did like the writing and was fascinated by the culture of the visual kei scene. I knew a little tiny bit about it but this really made it come alive for me and that was really cool. I also enjoyed Teru as a c I am extremely conflicted over The Stars May Rise and Fall and I've never really felt this way about a book before so if this review rambles a bit that's why. I finished this several days ago but really needed time to process things and figure out why I struggled. I’ll start with the good: I did like the writing and was fascinated by the culture of the visual kei scene. I knew a little tiny bit about it but this really made it come alive for me and that was really cool. I also enjoyed Teru as a character and found him very endearing and real. He’s never really admitted to himself that he might like men more then women so initially he’s troubled over his feelings for Rei. I felt Teru’s journey to understand himself was very genuine and a nice counterpoint to the confidence he shows as a musician. The author’s choice to write about a crippled hero who is really struggling with the basic day-to-day tasks was also a nice step away from the norm of romance novels. A horrific car accident has left Rei the only survivor of his band but he deals with constant pain, arm and leg braces, a scarred face, and a lot of mental and emotional trauma. I really wish we had Rei’s POV in the story so I could better understand him as a character. Unfortunately, not everything worked for me in this book. Teru falls in love too quickly and they move into the type of comfortable, living together relationship that long married couples have. While I understand that Rei’s physical limitations mean that sexual intimacy is harder for him, there still could have been smaller intimacies that showed these two cared for each other. Every once in a while we’d see that through small touches or actions but I craved more since everything else was so heavy. The step of entering a relationship just felt too abrupt and I never fully believed they were in love. Rei especially is very hung up on his lost love who was killed in the car accident it felt like Teru was just a replacement for the man that Rei couldn’t have. I was also really confused by the “relationship” between Teru and Kiyomi and maybe this is a cultural thing I just wasn’t aware of. Teru and Kiyomi go out on a few dates early in the book before Teru figures out he’s attracted to Rei. I never felt like they had an actual relationship and instead had just gone on some dates. No commitments were verbalized and they hadn’t spend any time with each other in a while when Teru tells her he’s with Rei. Kiyomi is hurt and feels like she’s been betrayed and this made their relationship seem deeper than I felt it came across on the page. Maybe this is me not understanding the way dating works in Japan but I didn’t understand the level of her anger. Overall, the pacing never quite felt right and I think there were parts of the book that could have been left out. I’m also not a fan of the ending AT ALL. I felt like the whole ending proved that Rei was right and they couldn’t have love and fame at the same time. On top of that, Rei never really grew as a character while Teru develops a lot so when they find each other again it seems like all the same problems would still exist. Such a beautifully written book! I mean, who wouldn’t want to read an MM story located in Japan? The Stars May Rise and Fall by Estella Mirsi is a turn of the millennium M/M retelling of Phantom of the Opera set in Japan. It is a beautifully told story of two men trying to live their dreams even if it's in a form they envision ot being in. It explores the idea of learning to accept yourself and forgive your past, to heal your scars through your art and learn to let love back in. I had so many emotions while reading this... their journey is real and touching. 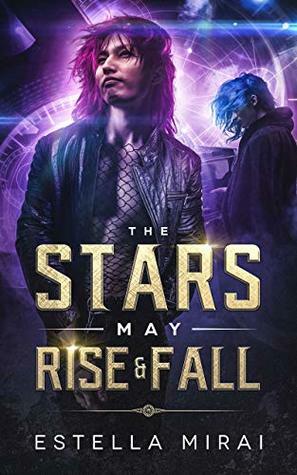 Teru and Rei are amazing charact The Stars May Rise and Fall by Estella Mirsi is a turn of the millennium M/M retelling of Phantom of the Opera set in Japan. It is a beautifully told story of two men trying to live their dreams even if it's in a form they envision ot being in. It explores the idea of learning to accept yourself and forgive your past, to heal your scars through your art and learn to let love back in. I had so many emotions while reading this... their journey is real and touching. Teru and Rei are amazing characters that grab your attention and their story touches your heart. I must preface this review by saying I have never watched or listened to Phantom of the Opera, so while The Stars May Rise and Fall is a queer retelling of the opera, my review and opinions are based solely on the story as a standalone. The Stars May Rise and Fall reads a lot like being on the cusp of... something. Everything. It's the year 2000, on the cusp of 2001. Teru and his band are, at first, on the cusp of mediocrity, then on the cusp of a major contract. Teru himself is on the cusp of ro I must preface this review by saying I have never watched or listened to Phantom of the Opera, so while The Stars May Rise and Fall is a queer retelling of the opera, my review and opinions are based solely on the story as a standalone. The Stars May Rise and Fall reads a lot like being on the cusp of... something. Everything. It's the year 2000, on the cusp of 2001. Teru and his band are, at first, on the cusp of mediocrity, then on the cusp of a major contract. Teru himself is on the cusp of romance, waiting to see if he falls in one direction or the other. There is a lot of anticipation - without angst - in this book, and it's very well-written in that I didn't feel anxious about what would happen, wasn't breezing through to get to the next chapter to see what would happen, but merely enjoying the ride and the story that was being told. I was enthralled with the storyline of Teru's band, La Rose Verboten. It was fascinating reading about their performances, rehearsals, band meetings, drama, disagreements, celebrations. I had Google open on my phone as I read, constantly looking up things that are mentioned (questionnaires from fans, uchiage after shows, etc) and learned a lot about the Japanese music scene. I was super impressed with the amount of work that went into each aspect of this book, from the medical to the musical and everything in between. Where I struggled with this book is in the romance between Teru and Rei. Their relationship is very much told, not shown, and reads as super insta-lovey because of this. I'm assuming a lot of internal processing happens on Teru's part that we are not shown, because he pretty much jumps straight from apprehension and indifference about Rei into full-on love. There are also very large gaps in time in certain parts of the book, two of which would have been, in my opinion, instrumental to the relationship building at two very key points in their relationship. As characters, they jumped off the page and had me wanting to know more about them, had me feeling deeply when we learned more about Rei's past, and as Teru experiences the rollercoaster of a serious relationship. But as a couple, and as a romantic pairing, they were flat to me. Take this with a grain of salt - I'm not familiar with Japanese culture so this might be the norm for romances set in the country. But the romance didn't quite meet my expectations. I definitely would recommend picking this book up as the story of a visual kei band trying to make it big in Tokyo in 2000. About healing and comfort, moving past heartbreak and tragedy. About finding oneself and making dreams come true. The writing is vivid and evocative, full of emotion and with a musical quality to it. It's a wonderful debut novel for Estella Mirai, and she is definitely a new author added to my watch list. So I read this book in a day! A freaking day!! This was free copy in exchange for an honest review... So honest it shall be! Firstly I'm sorry but this cover caught my eye straight away because it's freaking stunning. I never knew if the way it was layed out meant anything but it does and it's even more amazing once you read the story. The 'retelling' of Phantom of the Opera indication... Yer apart from the mask didn't really feel that vibes but this doesn't take away the story for the book itself So I read this book in a day! A freaking day!! The characters were just like the synopsis said; complex yet slightly awkward which works perfectly in this storyline. I completely fell in love with Rei, his story just captures your heart from the begining and drives the story in such a way it broke my heart at the end of this book 💔. He is just relatable for everyone who struggles with body image issues and self loathing. Teru is just as complex but that's due to the fact this man has no idea what he wants in life most of the time, which is slightly frustrating if I'm honest. And kinda had me feeling slightly angry with him as he kinda puts the story on hold imagine few places. The storyline and underlining stories are very relatable even in a metaphorical view too. The problems I think people will find when reading this book is if you have no knowledge of history or language them pronunciation of the places, names and styles in this book will be an issue. Luckly I found it fine due to my love of foreign TV, music and YouTubers from over there however. The writing itself is very fast pace and it's a very easy read. I found the authors way of writing just flows for me personally and her knowledge of the styles of music is amazing and the explanations are on point if you do struggle. The Stars May Rise and Fall is a Visual Kei/male-male romance retelling of the Phantom of the Opera set in Tokyo in the early 2000s. Vocalist Teru dreams of becoming a huge star but his band struggles with their direction and combined with their arguing means that they’re finding it difficult to get the break that they are looking for. This all changes when Teru finds a mysterious business card belonging to disabled composer Rei whose own career ended tragically years earlier. With Rei’s help, Teru’s dream is finally close to becoming reality. When the two of them start to develop feelings for each other, Teru’s denial and Rei’s struggle to let go of the past looks set to put an end to both their budding romance and Teru’s career. I loved this novel. It is a very subtle retelling which is exactly the kind of story I enjoy; there is enough there to connect it but it is also refreshingly different and can be enjoyed without being aware that it is a retelling. The story itself is a slow-building and beautiful romance between two characters who have had their share of hardships and want more than anything to be together despite the obstacles that stand between them. I loved the Visual Kei setting, as a huge JRock/Visual Kei fan myself I very much enjoyed the references to bands I know and love. The characters themselves are very relatable and you can really feel everything that they are going through. The two of them have an incredible connection to the other and this is really conveyed through their interactions and even when they are apart. Teru was in a funk, feeling like he had an expiration date approaching, even though he as still a young man. Playing drums in a band that was stagnating. When he is approached by a man that wants him to sing. Stepping out from behind his drums is scary, exhilarating, and definitely out of his comfort zone. Very unsettled because he thinks he may be gay. Trying to find his way. Rei is covered in scars, inside and out. He allows Teru into his life unwilling. He eventually shares his story and his s Teru was in a funk, feeling like he had an expiration date approaching, even though he as still a young man. Playing drums in a band that was stagnating. When he is approached by a man that wants him to sing. Stepping out from behind his drums is scary, exhilarating, and definitely out of his comfort zone. Very unsettled because he thinks he may be gay. Trying to find his way. Rei is covered in scars, inside and out. He allows Teru into his life unwilling. He eventually shares his story and his scars. Their relationship is not a typical boy meets boy kind of book. I’ve always been a Phantom fan. The music has always makes me reflective and kind of sad. I wish I could hear the music in this book. I can picture Teru on stage with his expressive hands, singing to Rei. For most of the book I felt that Rei was sort of an almost abusive partner. Only towards the end did I understand that the whole book was about giving Teru what he had always wanted. This won’t be a book for everyone because it’s so sad and yet hopeful. I enjoyed it. This review has been hidden because it contains spoilers. To view it, click here. I really liked this book as a novel it's own right. It was beautifully and I really felt for the characters. I also liked how the author decided to let Rei ( the Phantom in this version) go out in public. However, as a Phantom of the Opera re-telling, I found it lacking. In the original story, the Phantom has to go to great lengths to ensure Christine gets centre stage and the attention she deserves and in this version I felt that Teru becoming the lead singer happened too easily. I also thought t I really liked this book as a novel it's own right. It was beautifully and I really felt for the characters. I also liked how the author decided to let Rei ( the Phantom in this version) go out in public. However, as a Phantom of the Opera re-telling, I found it lacking. I also thought that Kiyomi was going to be this novel's version of Raoul but that never materialized. I could have very easily forgotten that this was a Phantom of the Opera re-telling if I was unaware of it being a re-telling beforehand. The Stars May Rise and Fall is an emotional, complex and accomplished novel by Estella Mirai. There is so many layers to Rei and Teru, and their developing relationship is amazing. Rei. Wow. How could one not love Rei. He's crippled and disfigured, but finds hope in Teru, wanting Teru to play and sing his music. And Teru. Dear lord, Teru. He wants so badly to love Rei, but unveiling Rei's wig and mask is not so easy. Their story contains so much love, so much guilt, and so much pain. I love The St The Stars May Rise and Fall is an emotional, complex and accomplished novel by Estella Mirai. A new and different read. One wants fame and fortune, one has already had it. Both are looking for love and acceptance of who they are. The character development was magnificent as was the world building. Every emotion they had, every twist the book makes you feel it. The Stars May Ride and Fall was a beautifully written M/M romance that I can not wait to read more by Mirai!! Although the book was described as being a retelling of “The Phantom of the Opera”, I didn’t feel like it was and didn’t enjoy that aspect of it. I did enjoy this story with how Teru and Rei came to work through everything and how their relationship grew, although I found it to be maddeningly slow at times and to drag, it took me a while to finish it. I received an ARC of this book in exchange for an honest and unbiased review.